My design wall is a hodge-podge of blocks today. Lots of projects but nothing is far enough along to be anything yet. Blocks for a fund raiser quilt. This quilt will be raffled off to help support The Quintessential Quilt 2017 quilt show in University City MO. 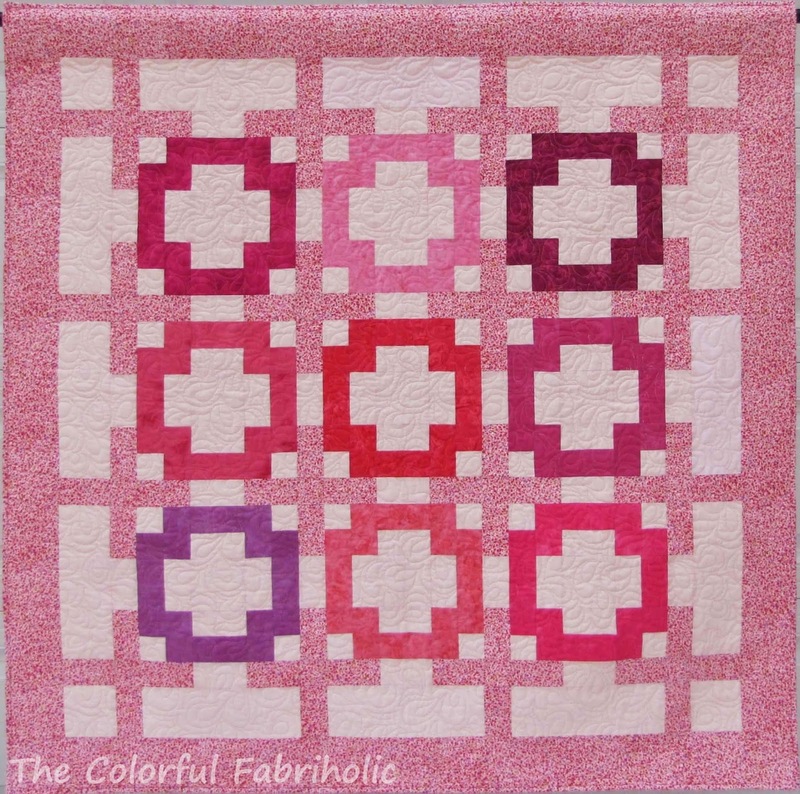 Members of CSQ guild are all making blocks - several types - and sashing units for this quilt. Blocks are due at the July meeting. A Bee block in greens. She asked us to raid our green scraps, and I had a lot of greens. 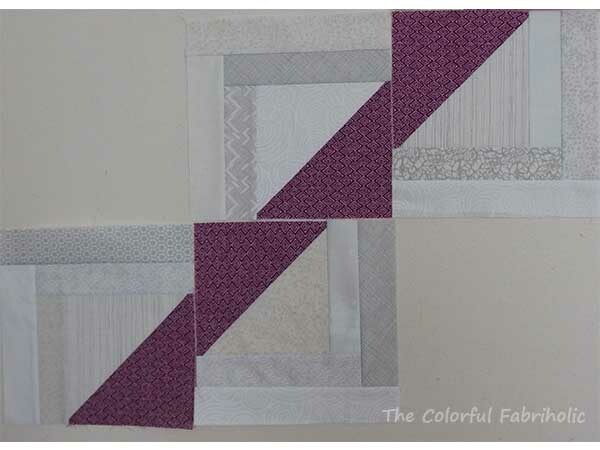 Purple test blocks for a new project. I'll work on piecing more of these Log Cabin Triangle blocks at a sew-in and a retreat later in June. For budget reasons I need to quilt it myself, not send it to a long armer, but it will be the largest I've ever attempted. My quilting skills are limited to the walking foot and free motion meandering. 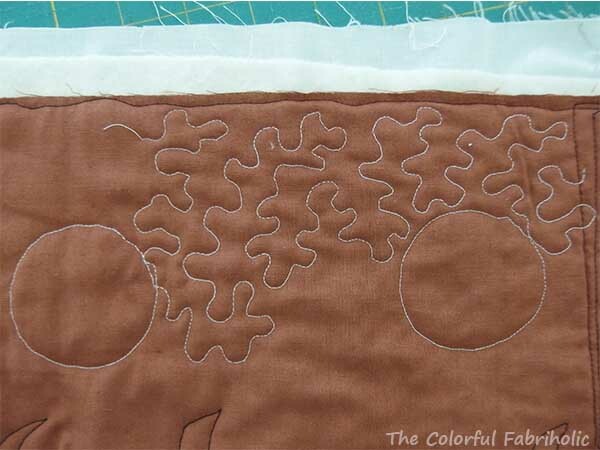 I've considered several design possibilities, including wavy organic lines a la Lorna of Sew Fresh Quilts, an allover meander, and a modified meander. The circles measure a little less than 3" across. With the stitch regulator on my new Bernina I can manage to sew around them on the markings, although they're by no means perfect circles. I thought about trying to meander the background and FMQ in the ditch around the plus shapes, but it's a lot of sharp turns. The circles may be easier. Or not. This quilt is 60 x 75" and that's a lot of weight to wrestle with. I'm very apprehensive about quilting this one. Maybe I should go back to the organic wavy lines concept after all. Input and suggestions are welcome; please leave a comment. OK, technically we have a couple more days in May, but with no finishes or purchases planned, I can go ahead and post my monthly update today. Not too bad; I can certainly recover to break even for the year if I have some finishes as planned. 1. Layer & baste at least one existing top. 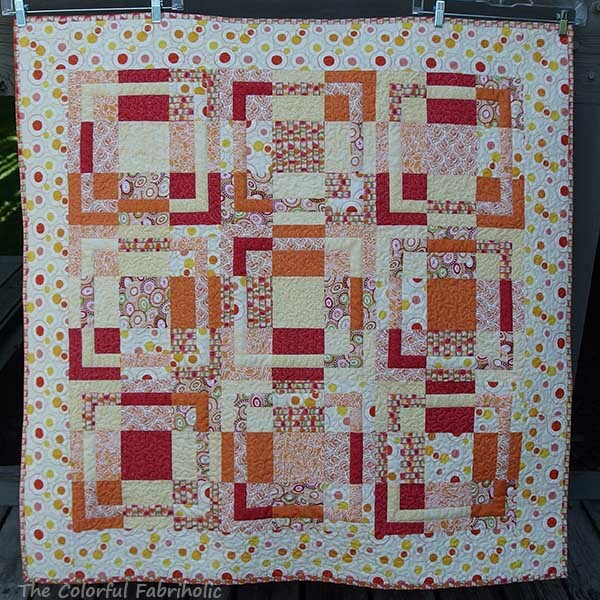 DONE; basted Dancing Plus and also marked it for quilting. 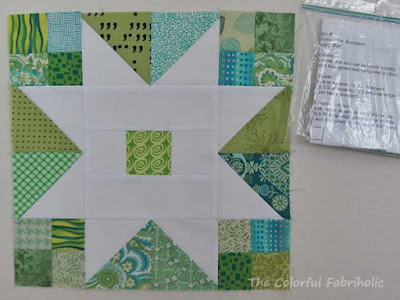 Other: Layered, basted, quilted and bound Framed 9 Patch tutorial sample. That's a lot to keep me busy, and some of those projects have deadlines! I guess I'll have to stay focused. 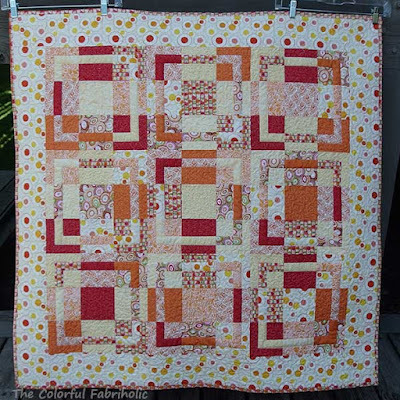 Back in February & March when I was working on this quilt, I said it was for Hands2Help Happy Chemo. 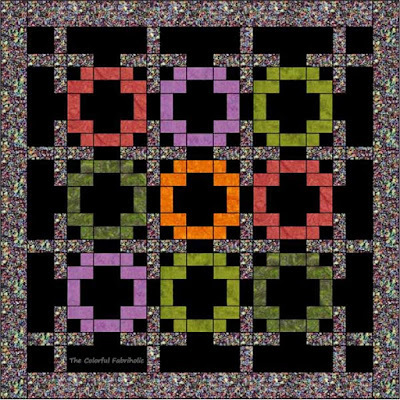 Positively Radiant, 2016, 62 x 62"
Then a local need arose, so I talked to Sarah at Confessions of a Fabric Addict, who organizes the Hands2Help challenge. I asked her if I could give this quilt to a local chemo patient, a member of my Modern bee, instead of sending it away to Happy Chemo. Sarah said sure, and reminded me to link up to Hands2Help. This quilt, originally referred to as the "busy pink plus quilt" was christened "Positively Radiant" by a blog reader. I think the name is so fitting! "Positively Radiant" was given to my local friend, along with a care package from all of us in the bee. Our friend is incredibly strong, and we're all hoping for a good outcome for her. Meanwhile, she was very touched by our gifts, including this quilt. This quilt was made a few months ago so I could practice spiral quilting on my brand-new Bernina, to become familiar with the new machine and improve my quilting. I'm sending it to Happy Chemo for Hands2Help. Hands2Help is a comfort quilt donation drive organized by Sarah over at Confessions of a Fabric Addict. At 44" x 58" it's a small lap size, but maybe it will bring comfort to a young girl or teen who's going through a tough time. 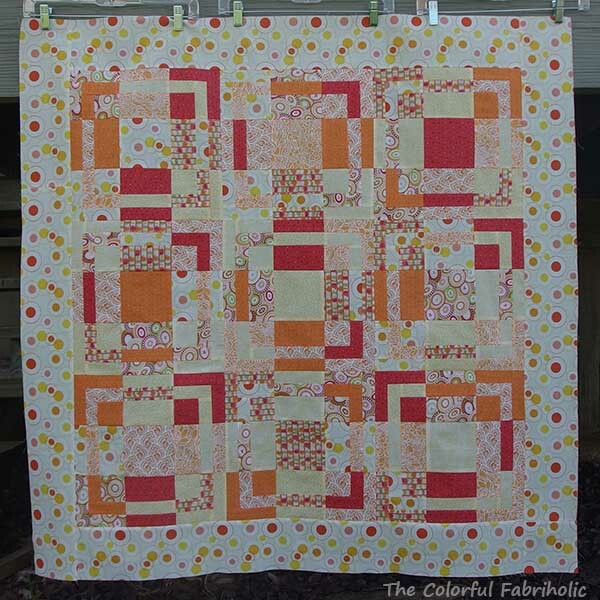 I knew when I made this quilt that it would be a donation quilt. 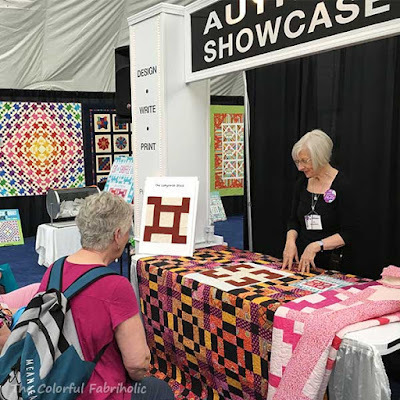 I'm very fortunate to be able to make quilts to give to others. 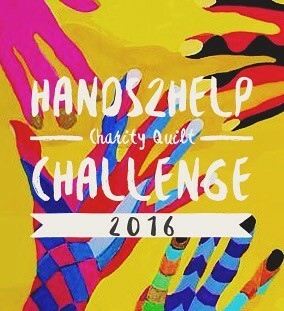 Sarah has at least 125 participants in Hands2Help this year. Check out what everyone's been making in her link up over at Confessions of a Fabric Addict. I've been experimenting with some simple blocks. These are HSTs partially surrounded with logs, and they'll finish at 9". I'm using some of that purple from Paducah, plus lots of low volume neutrals. One of my goals for this month is to kit up a project to piece at an all day sew-in in June, so this is the beginning of that project. Like any log cabin design, there are lots of layout possibilities for playing with the light/dark placement. But since these are not exactly half light and half dark, the resulting patterns will be wonkier or more interesting. So far so good. I have some periwinkle (blue-violet) that harmonizes well with this red-violet. 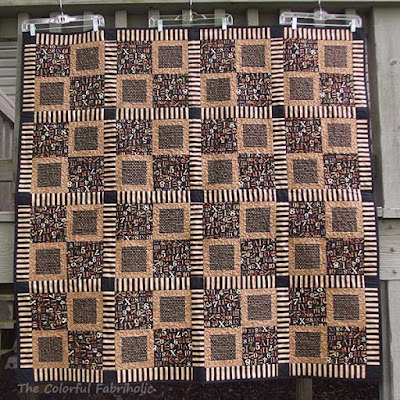 I think I'll kit up some of both colors and lots of neutral logs, piece the blocks at my sew-in, and play with the layout when I have lots of blocks to work with. Since I missed the stash report yesterday, here's the update: No fabric in, 1/4 yard out for doll dress. 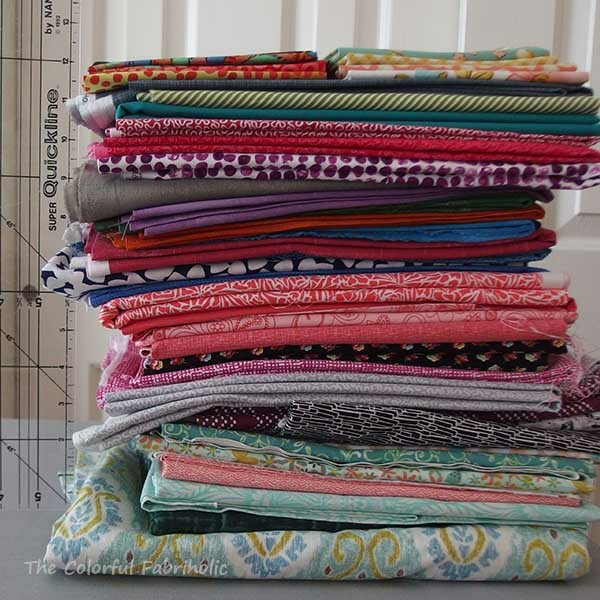 Each year Sarah over at Confessions of a Fabric Addict organizes a drive for comfort quilts called Hands2Help. Last year was my first time to participate, and this year I jumped in again because it's such a worthwhile endeavor. This masculine quilt that I finished in April is destined for Happy Chemo. I specifically chose manly colors and prints, but I actually love this black & tan combo myself. At 58" x 58", this is a good lap size, and I hope it brings comfort to someone. It was a pleasure to make and I'm glad to have a place to send it to. Much better than just taking up space in my closet! 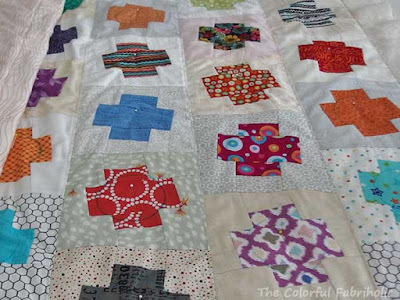 You can see more Hands2Help quilts over at Sarah's blog. She has 125 participants this year. 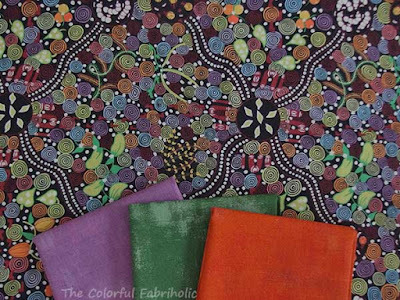 Check out all the inspiration at Confessions of a Fabric Addict. 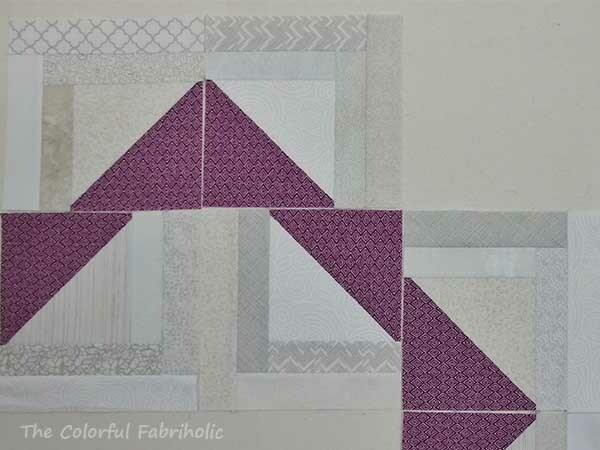 My friend Stephanie Palmer of Late Night Quilter and The Quilter's Planner fame has made a quilt using the block construction method in my book Cut and Shuffle Quilts. 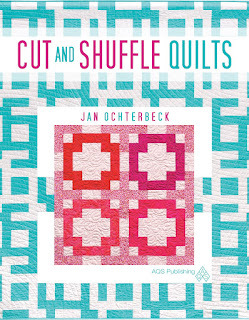 Stephanie kindly agreed to make blocks and post a book review of Cut and Shuffle Quilts. She went way above and beyond! She made several of my Plus blocks using the Block Mama method of making a parent block, cutting it up, and shuffling the parts. 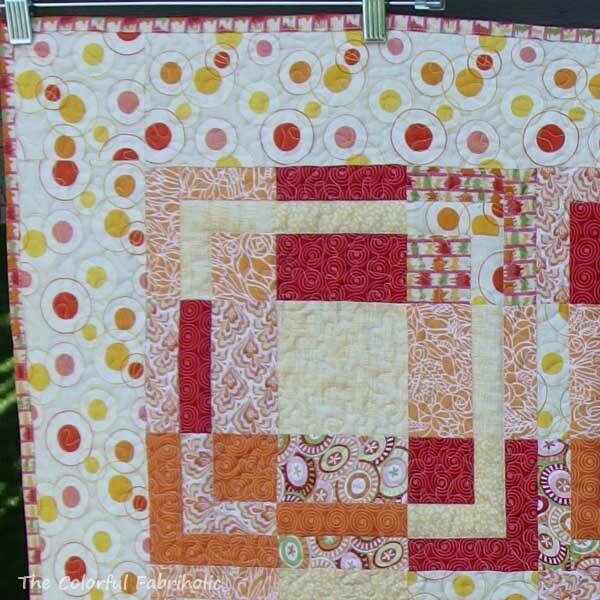 Her quilt is awesome! She totally made it her own using a modern layout with lots of negative space. And her quilting is spectacular. 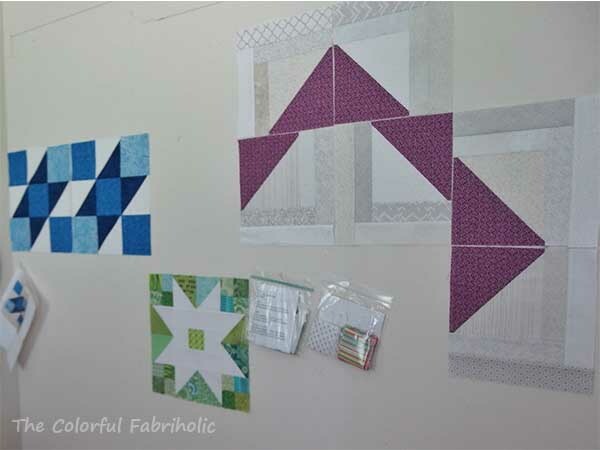 Stephanie used her Cut and Shuffle Plus quilt as a teaching sample at a retreat in Fredericksburg, Texas. Check out her post here for more about her classes and the retreat center. It looks so inviting! 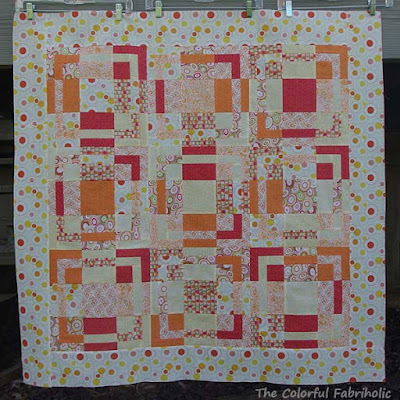 Stephanie's layout and quilting really enhance the Plus block in the quilt above. 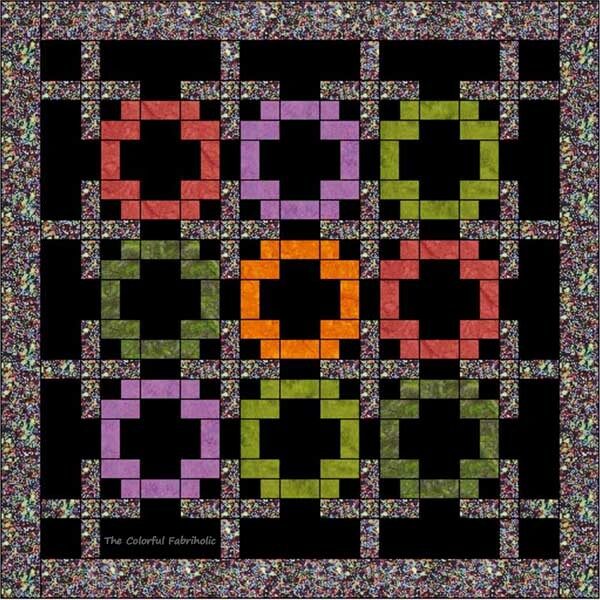 Below is my original version as featured in Cut and Shuffle Quilts. 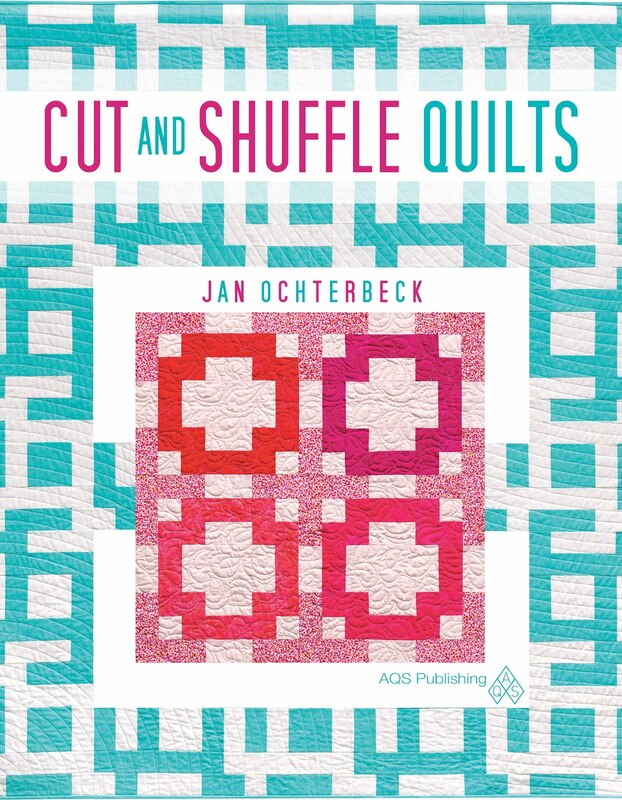 If you're interested, you can purchase Cut and Shuffle Quilts from Amazon.com or AQS. If you'd like a signed copy you can order directly from me ($24.95 includes shipping) by leaving a comment; US only please. 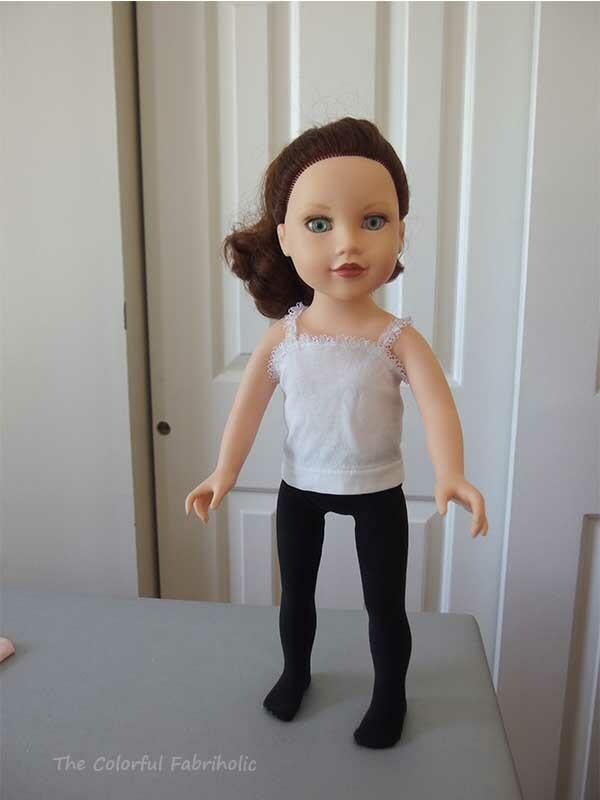 OK, I fully admit I'm obsessed with making doll stuff. I said I'd make one outfit or accessory set a month from now 'til Christmas. 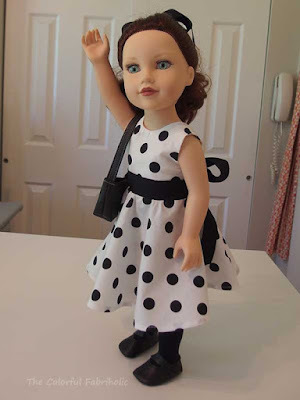 This month I made accessories and an outfit. Here's Gracie in her new party dress; my niece wore a dress just like this for Easter. OK, so It's just a little finish this week, and next week I'll get back to quilting. Linking up with Whoop Whoop Friday at Confessions of a Fabric Addict and Friday Finish at Crazy Mon Quilts. Since I finished up the Framed Nine Patch, my design wall is currently empty. I have an idea for a new project, but it will have to wait. I seem to have developed a new obsession. I've named her Gracie, but my little niece can name her whatever she likes later. I may have gotten a little carried away with making things for her. I picked up some baby things at the thrift store thinking I could modify them or use the fabric. I also found a commercial pattern that has basic pieces - shirt, pants, shoes - that I can modify as needed to make pretty much anything. 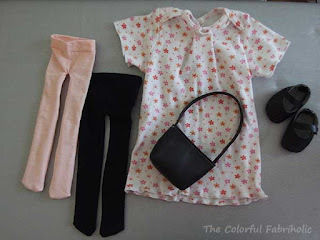 So Gracie now has tights, a nightie (made from an infant onesie), a purse, and shoes. And a cami with lace trim. I planned to make one outfit or accessory set a month from April to Christmas. 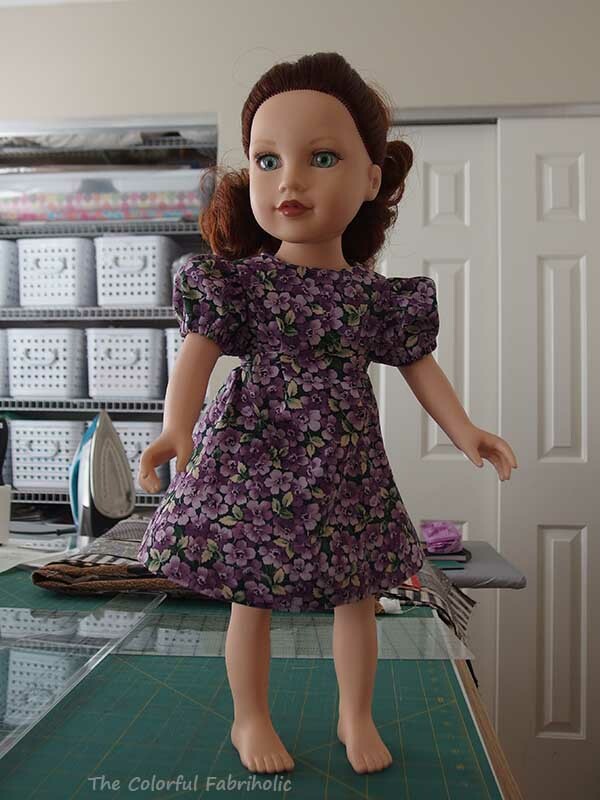 I'll definitely end up with more than that - I've become obsessed with making things for this doll. 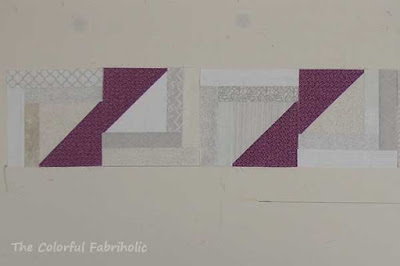 Pattern-making in 3D is different than pattern design for quilts, and I'm using skills I haven't used in years. I'm having fun with it. Maybe in my retirement I've entered my second childhood???! Anyway, that's what I'm working on while I figure out what quilting project to work on next. Check out the quilting projects on everyone's design walls over at Patchwork Times. A finish this week means I get to count the backing and binding out. 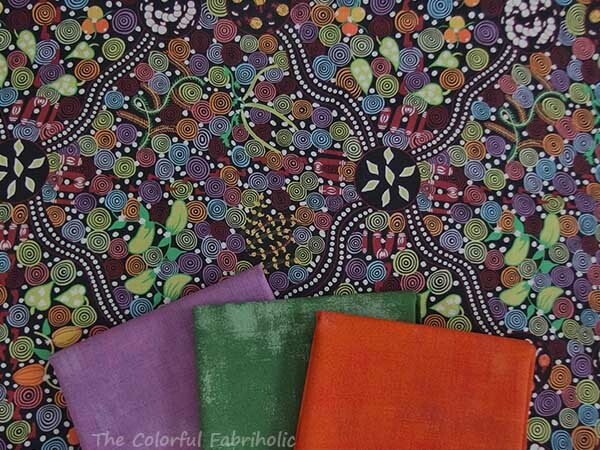 And no new fabric in this week - yay! Framed Nine Patch, 44" x 44"
I cobbled together the backing, and I'm estimating that it used about 2 yards. The binding used 3/8 yard. This Framed Nine Patch was made entirely from stash, front, backing, and binding. If you're interested in the tutorial for the Framed Nine Patch, Part 1 is here and Part 2 is here. I'll try to get better photos later; the wind was helping too much when I took this one. Monthly and YTD totals to come at the end of the month. I've had a lot going on lately and haven't been able to spend much time in the sewing room, but I managed to get my Framed Nine Patch quilted and bound. I quilted it with an allover stipple but left the "frames" in each block unquilted to emphasize them. I'll be able to count out the backing and binding on my next stash report. After Paducah, I need all the finishes I can get to use up stash! 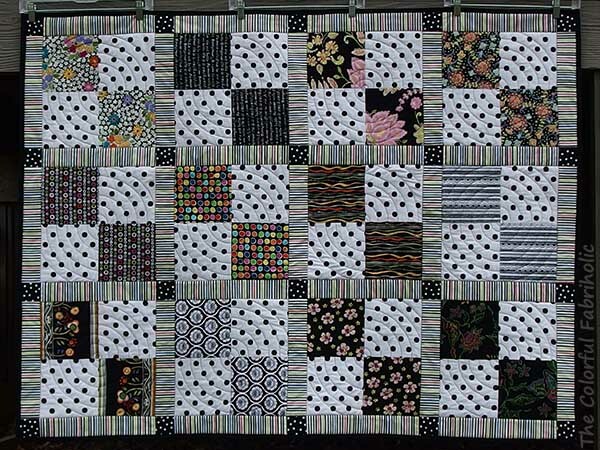 Today the only change is that the rows are sewn together. Maybe I can get this layered and basted this week. Today I'm getting together with my friend and long arm quilter Sandy to pass this quilt and its backing to her. Sandy does beautiful custom work, but she has a very long waiting list. I'll put my name on the bottom of her list again even though I don't have a quilt in mind for it today, because by the time she's ready for me in 9-10 months I'll have something for her. Here's an EQ mock-up of what it will look like. 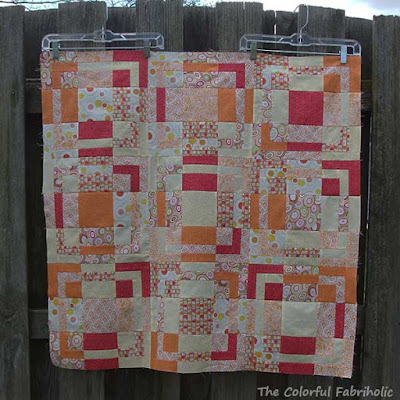 I just love how changing up the fabrics & colors can make a design look so totally different! I always think of my pink Positivity as a great quilt for a breast cancer patient, but the Aussie version doesn't have that connotation at all. I purchased two yards of the Aussie print at my LQS yesterday. 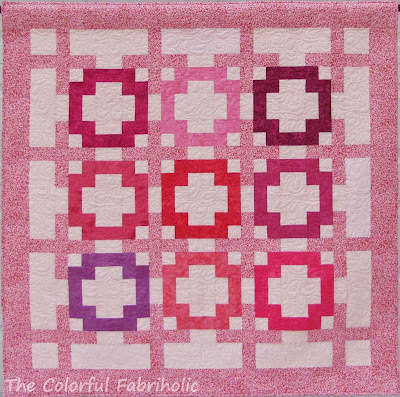 I'm planning to make another version of Positivity from my book, Cut and Shuffle Quilts, and this will be the focus print. I acquired the Grunge prints in Paducah, but I need some more colors, which I'll look for locally. I'm planning for this to be a shop sample for another Cut and Shuffle class later in the year. This is the original Positivity, and I'll use the Aussie print where the speckled print is in the original. Moving in the wrong direction; I'll calculate the totals at the end of the month. It's been awhile since I've been able to post a work-in-progress post. Last month I posted tutorials for my Framed Nine Patch (Part 1 and Part 2), and completed a new top. Now it's time to cobble together a backing for it. To plan the backing, I put the top on my design wall, and I'm building wide strips of fabric from stash that will be big enough to cover the top. 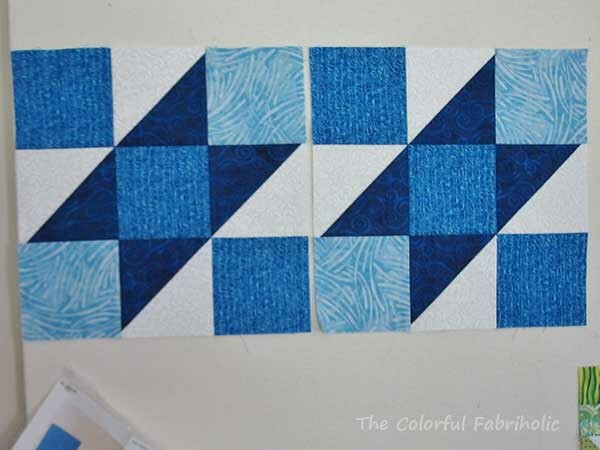 Here are the strips (rows) but they're not sewn together yet. 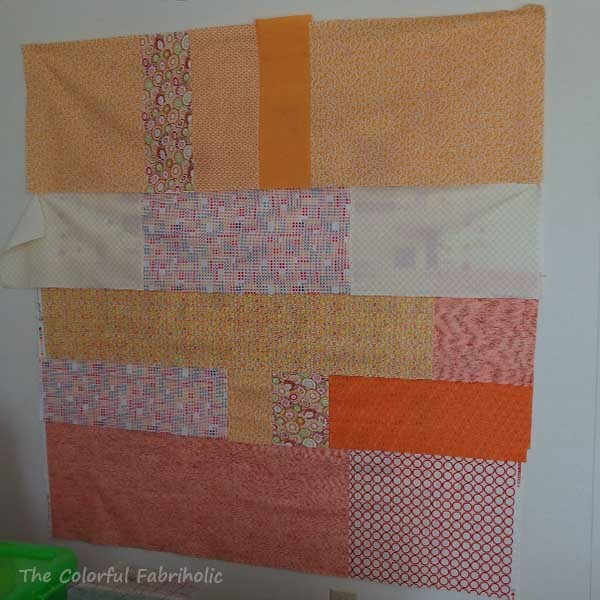 The fabrics are whatever I found in my stash in the orange and yellow bins that would work, that I could use up. Hopefully I can get this little quilt finished up this month. Usually I post my goals update along with my month-end stash report, but I ran out of time yesterday, so the goals update had to wait 'til today. May is going to be like that - I have some family stuff etc. going on so sewing time will be limited. April was a very productive month, though. 3. Make new demo samples for AQS Author Demo Booth, Paducah. DONE. Also made pillowcase-style bag to carry the small foam core boards in. 6. Have fun in Paducah. DONE!!! Oh, yeah, so much fun. 1. Layer & baste at least one existing top. (If time permits, start quilting). 2. Prep backing for Maple Leaf Star top, and take top & backing to long arm quilter. 3. Plan a project to piece during Sew-In in June. 4. Make one outfit or accessory set for doll. 5. Keep up with bee blocks. 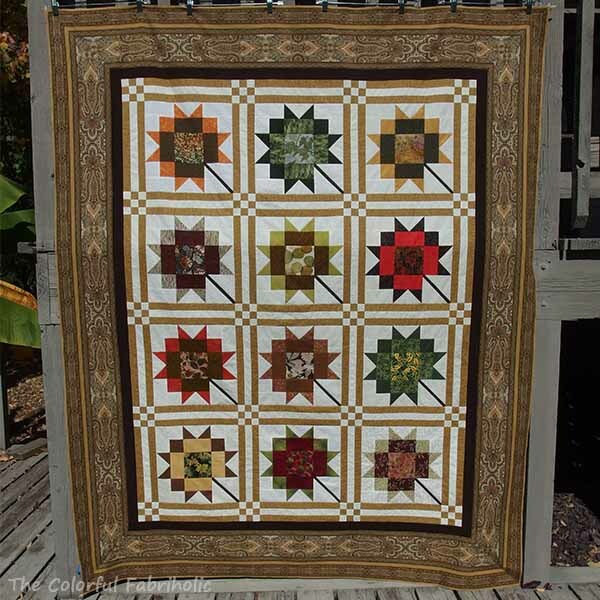 This is the Maple Leaf Star top that's going to the quilter this month. I don't know if she'll get it done this month, but at least it's percolating to the top of her list. Her list is usually several months out, and in early April she told me she'd be able to get to it soon but not until after Paducah. This quilt is destined to be a Christmas gift. 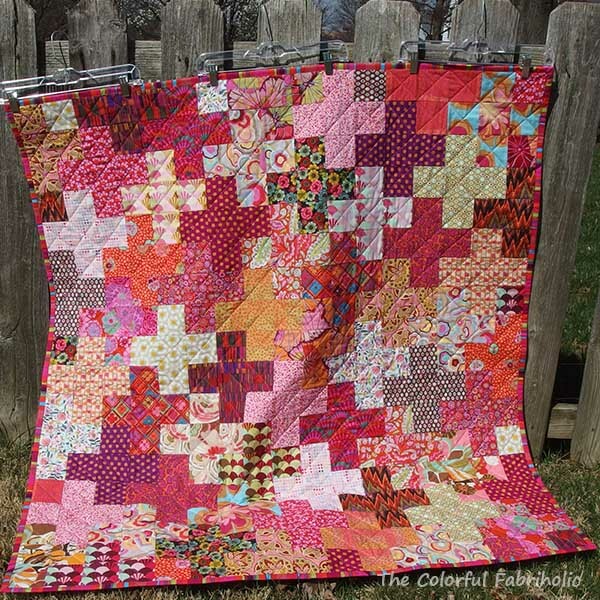 So although I don't actually have anything on my design wall today, I certainly have plenty to keep me busy in May, so I'm linking up with Judy at Patchwork Times. Not too bad. My goal for the year is to break even, and I'm pretty confident I can manage enough finishes to make up four yards over the rest of the year. Usually I combine my month-end stash report and my goals update, but today I'm pressed for time so the goals update will have to wait for tomorrow. 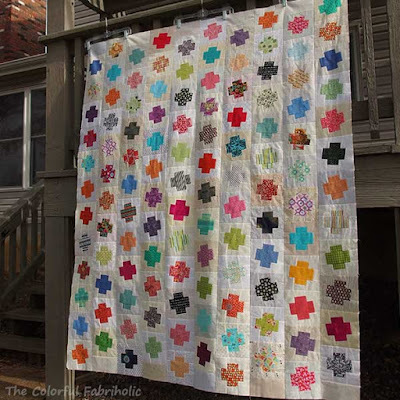 Linking up with Patchwork Times; check out everyone else's stash management efforts over there.